Home Designer Complete Headache or Real DIY doesn’t exist for MAC? Trying to do simple things with anything less than a $2500 CAD program can be trying. I started out with Chief Architects DIY software, Home Design Pro. At $499, it looked like a solid alternative to the $2500 package. All I want to do is tear down my garage, rebuild it a little bigger with a bonus room above it. Every Architect in town was $2500-$3500 for plans, and I had to do soil surveys at another $2500-$4200 and then provide “eventual structural engineering calculations”. I figured if I have to pay for the engineer, why pay the architect for something I should be able to do pretty easily. As advertised in one day, I had the drawings done, and then went to print the page so I could create the electrical, plumbing and HVAC pages. Nope, the error said I would need the $2500 software package. So some digging led me to Punch Software Home Designer Complete Mac. Very different learning curve than Chief Architect. Having been a D-Tools user for many years, Chief used several of the same commands. Punch not so much. Home Designer Complete can do the layouts I needed and in fact it organized them very nicely with tabs. It took a long time, and digging through the forum posts didn’t help at all, but I found structural callout diagrams for typical Type V construction. The problem is they are so small in the library, you have to open each one to find the one or two you want. Again the forums said you can’t create title blocks and pages, which I later found to be false. There are title blocks, buried in the 3D libraries. So I could build the pages. Since I don’t have a plotter at home the next challenge appeared to be scaling the rendering so I could print some test plots at home on letter sized and then blow them up at FedEX. This one stumped me, so I exported a DXF and a PDF that took 9 pages and started to look at what I had build in 3D. Seeing my home in 3D was quite different. 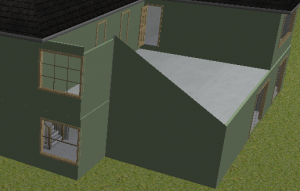 For instance, look how the 3D rendering treats a two story Vaulted Ceiling in Home Studio Designer Complete MAC. Notice how it leaves the area uncovered. It doesn’t know how to treat this type of wall I guess. Since this was the 3D part, that I call pretty sales pitch crap, I really didn’t care, but it would be nice to see the finished house since Home Design Complete Mac says it can do that. The colors are also funny. When you use the color tool and take a color from the palate, it is no where close to what appears on the house. Then the nail of death. 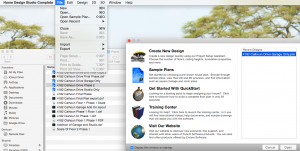 Punch Home Designer Complete Mac V 17.5.7 won’t save any updates. If I exit the software, it deletes all updated files, so I have been leaving it open. This morning I get a crash report, and reopen the software to this… Notice only one file, and see the items in the finder behind it? I saved several versions and changed the extension to try and protect them. I also exported two DWG files during the day to try and save them. Neither will import back. All work lost. Notice there is a DXF and a PDF of the “Final Phase” version, and the actual plan is gone even though that is the plan I was working on. “Save As” is not working for sure, not sure what else. I don’t know why or where Home Design Complete decided to save the file, but no matter what I start at the same spot in my design every time. The wall shell of the original house is there, the lot is way off and all my title blocks are gone.